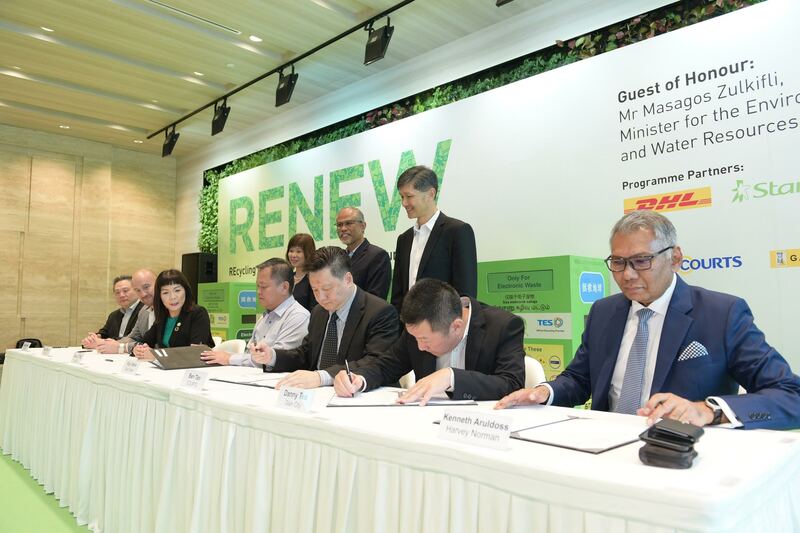 Four major electronics retailers – Best Denki, COURTS, Gain City and Harvey Norman – have joined DHL, Starhub and TES' RENEW programme to encourage the recycling of electrical and electronic waste (e-waste) in Singapore. Under the collaboration, the four retailers will place the RENEW bins in 20 of their stores across the island, according to a joint press release on June 5, 2018. The signing of the agreement was witnessed by Minister for the Environment and Water Resources, Mr Masagos Zulkifli, and Senior Minister of State, Dr Amy Khor, at Starhub Green. Signing of MOU between retailers, StarHub, DHL and TES. Photo courtesy: Starhub. 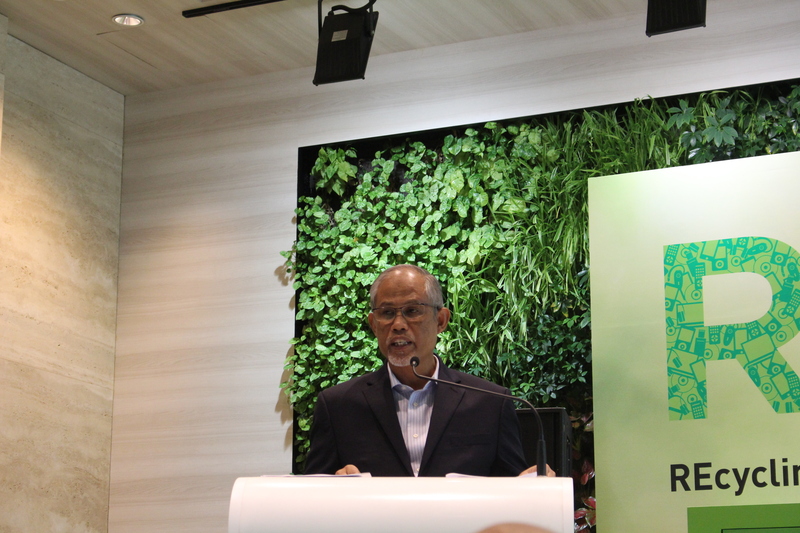 In his speech, Mr Masagos Zulkifli said that sustainable development has always been the key tenet of Singapore's nation building efforts since independence. "Singapore was one of the first countries, in 1972, to form a ministry dedicated to sustaining a high quality environment for its people. We spent S$1.8 billion on sewerage and used water treatment infrastructure in the 1970s and 1980s, and cleaned up our Singapore River. Pursuing growth at all costs has never been the Singapore way." He added that Singapore will work towards extracting greater value from waste as a resource, "so as to achieve our vision of a circular economy." Under the RENEW programme, Starhub provides the recycling bins, while DHL collects and delivers the e-waste to TES' recycling facility. The network of 468 RENEW bins can be found across 422 locations island-wide, including educational institutions, major malls, office buildings, community clubs and so on. "As an info-communications company, we are keenly aware of the importance of proper e-waste disposal, which is why we started this e-waste recycling programme over six years ago," said Ms Jeannie Ong, Starhub's Chief Strategic Partnership Officer. "Having the retailers join the programme would mean greater convenience and accessibility for members of the public in Singapore to safely dispose their unwanted electronic devices and equipment." Mr Julian Neo, Head of Commercial, DHL Express Singapore, added that, "With the pace of digital transformation, e-waste growth will only continue to accelerate. With the retailers lending their support to the cause, we have a good chance of winning this sustainability race."